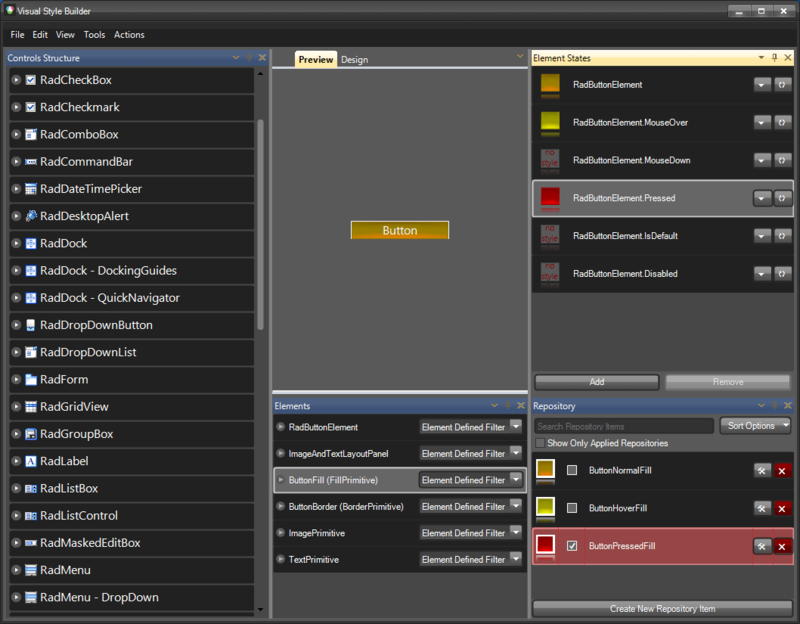 The purpose of this article is to introduce Telerik WinForms Visual Style Builder by describing the process of creating a simple theme for the RadButton control. This article emphasizes on all tricky moments that might occur while using the Visual Style Builder and explains them so that the user does not experience any issues when theming controls. 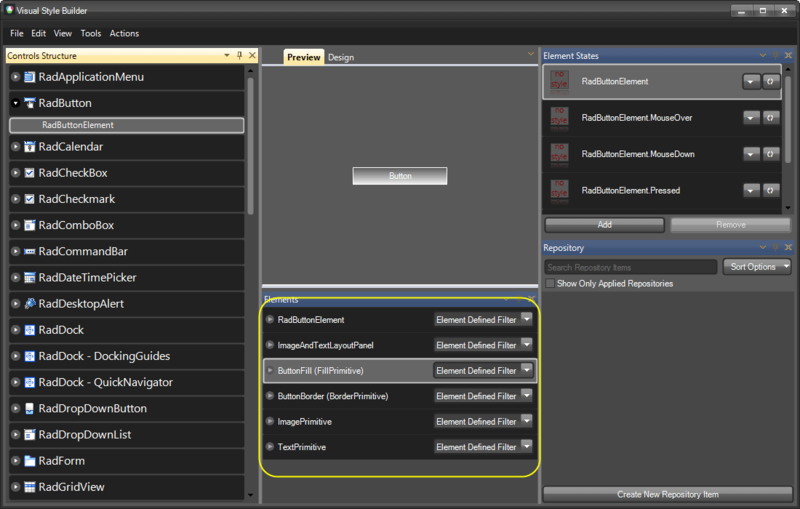 The tutorial begins with the creation of all needed repository items for styling a RadButton control and after that shows how to apply them. 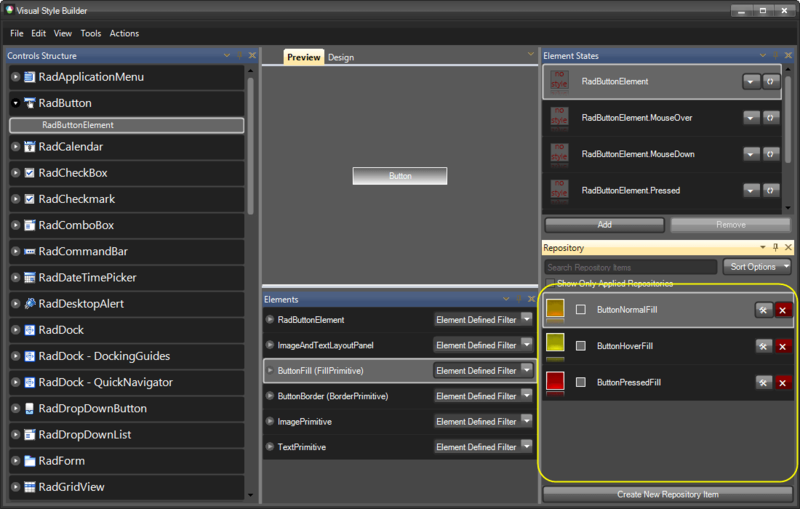 Below the Preview part of the form you can see the Elements Grid which displays the currently available elements for the current tree view selection that can be styled. In general, these are the elements which, once styled, sum up to the final appearance of the corresponding control. On the image above you can see the RootRadElement currently displayed. 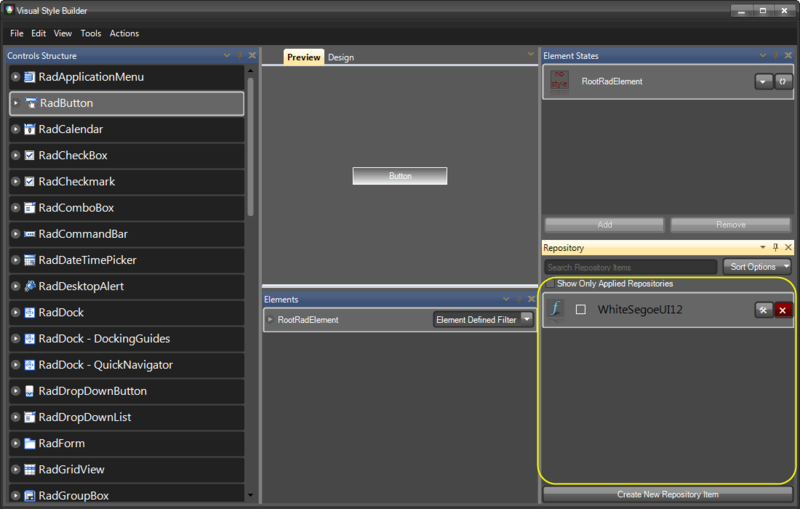 When selecting a control from the tree view on the left, normally its root element is displayed in the elements grid. You can use this element to apply common styles for the whole control that are inherited throughout the element hierarchy (the hierarchy that begins from the RootRadElement) like Font, ForeColor etc. 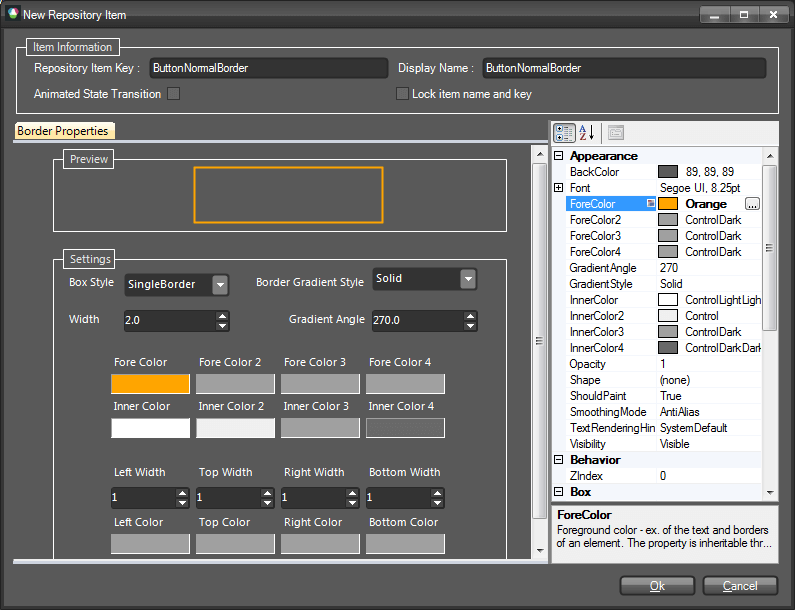 In this article we are going to demonstrate how to create and apply a repository item that defines the ForeColor and the Font of the button. For more information on repository items, check the Theme Repository topic. 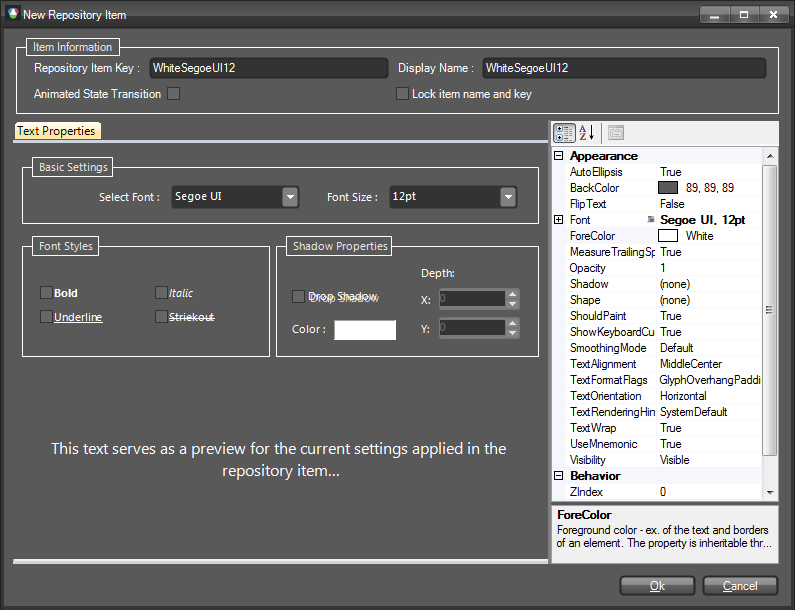 This is the Text Repository Item editor dialog. As discussed in the Theme Repository article, each repository item has a unique key and a display name. You can edit these properties by using the corresponding text boxes at the upper part of the form. In this demonstration, the repository item is called ‘WhiteSegoeUI12’. Its key is given the same value. 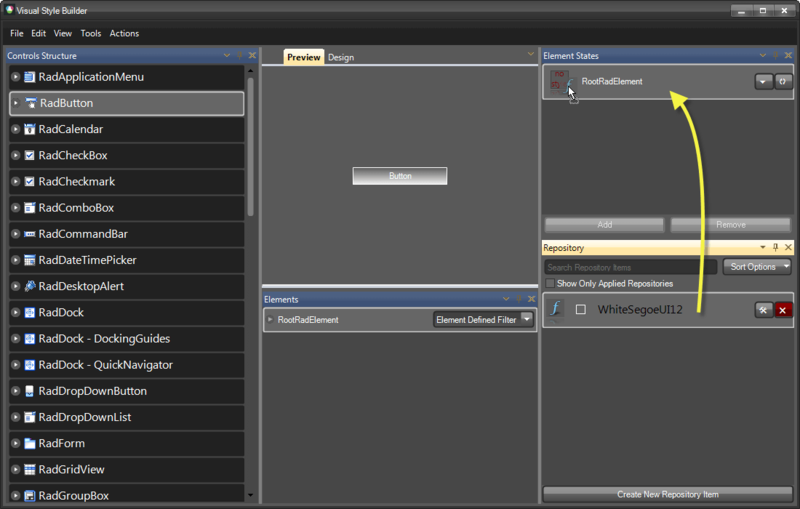 Note that the property grid on the right shows these properties in bold style which means that their values are explicitly defined in the repository item. Only the explicitly defined values are applied to an element when later associated with the corresponding repository item. Now that we have created all the repository items needed to style our button, we are going to associate them with the corresponding elements for the corresponding states of the button (normal, mouseover, pressed). If you hover/press the button in the Preview pane, you will see how the different styles are applied for the corresponding states. With this, you have finished styling the RadButton control. Now, you can save the theme and use it throughout your application. 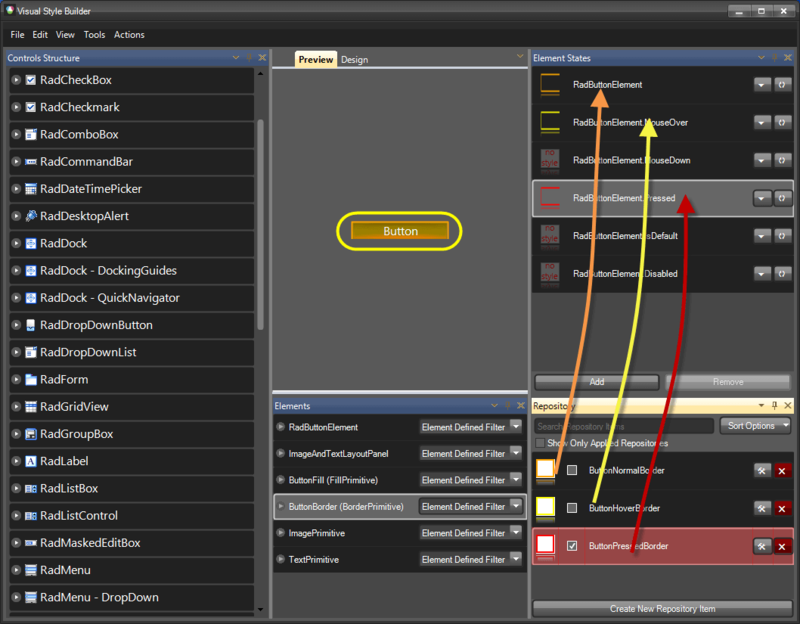 For further information on how to handle loading/saving themes, read the Handling Themes help article. It is important to know that styles applied for a given state are not reset when the item goes to another state. This might confuse those who are not familiar with this behavior. Scenario: We have a button with Normal, MouseOver and Pressed states. 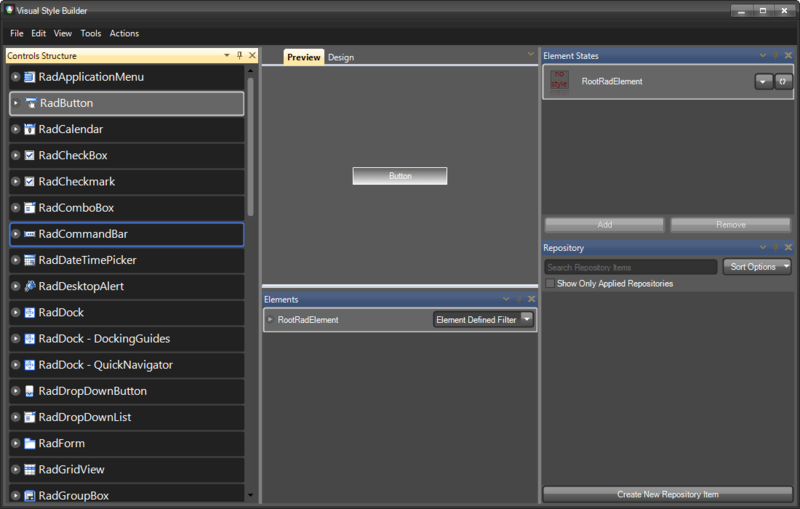 We also have a couple of repository items which we use to style the button for the different states. 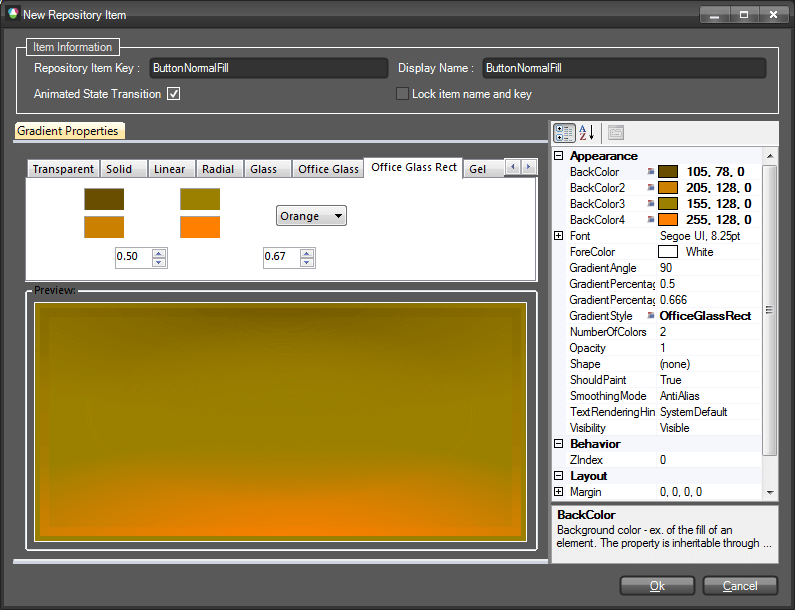 Let’s say that the first repository item we assign fill to the button for its Normal state, which sets its BackColor, BackColor2, BackColor3, GradientStyle and NumberOfColors properties. The NumberOfColors property is set to 3 and the GradientStyle property is set to Linear. 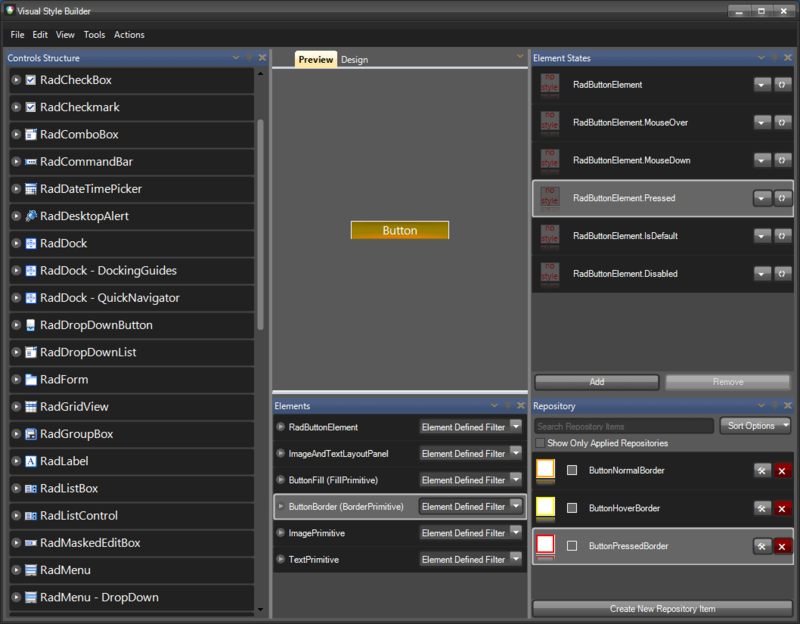 After associating the repository item to the Normal state of the button, the styles are applied correctly. Now, let’s say that we associate another repository item with the MouseOver state of the button that defines settings for the BackColor, BackColor2, BackColor3, BackColor4 properties, also for the GradientStyle (=Linear), but does not define setting for the NumberOfColors property. In this case, when we hover the button, the fill will not look as expected since its BackColor4 property value will not be visible. The reason for this will be that the NumberOfColors property will remain set to 3 as defined by the repository item assigned to the Normal state of the item. The main conclusion that we should make here is that each state must be assigned a style that defines all properties needed for the expected appearance of the element. This is the general approach when styling items in order to avoid confusion. 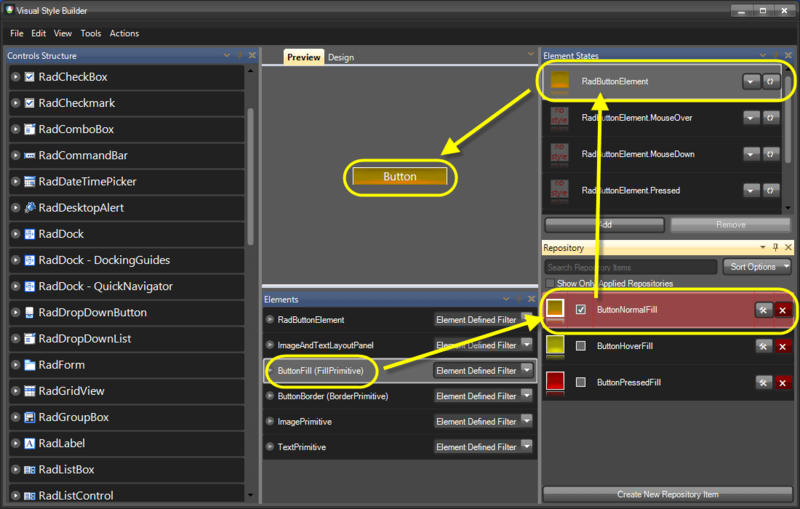 For more information see Precedence Example: Visibility Property at the end of this tutorial.